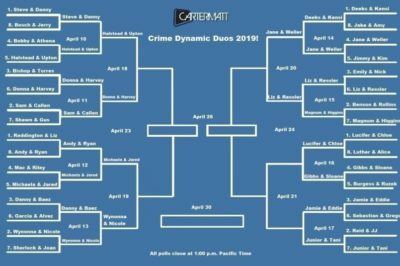 In this Crime Dynamic Duos showdown, Jane & Weller of Blindspot are facing off against Liz & Ressler of The Blacklist. In this Crime Dynamic Duos 2019 showdown, Jared & Michaela from Manifest are facing off against Wynonna & Nicole of Wynonna Earp. In this Crime Dynamic Duos 2019 battle, Jamie & Eddie of Blue Bloods are doing battle against Junior & Tani of Hawaii Five-0. In this edition of Crime Dynamic Duos, Lucifer & Chloe of Lucifer fame is squaring off against Gibbs & Sloane of NCIS. With this Crime Dynamic Duos piece, Liz & Ressler of The Blacklist are facing off against Magnum & Higgins of Magnum PI. Who do you want to see advance? In this particular Crime Dynamic Duos showdown, Deeks & Kensi of NCIS: Los Angeles are facing off against Jane & Weller of Blindspot. 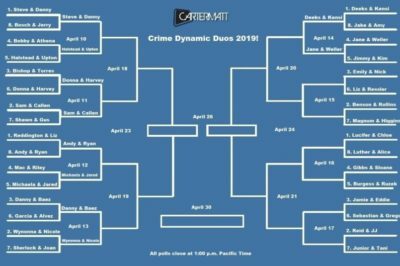 In this edition of Crime Dynamic Duos, Danny & Baez of Blue Bloods are facing off against Wynonna & Nicole of Wynonna Earp. In this round of Crime Dynamic Duos, Andy & Ryan of Station 19 are going to be facing off against Jared & Michaela of Manifest!